Here we see Earl Wilson, coming off his first full season with the Tigers, and about to embark on a season culminating in a World Series championship! Wilson was signed by the Red Sox way back in 1953. He pitched 4 seasons in the low minors, then lost the ’57 and ’58 seasons while in military service. He returned to the minors (triple-A) in 1959, but also played 9 games for the Sox during the 2nd half of 1959, and 13 games in the 2nd half of 1960. 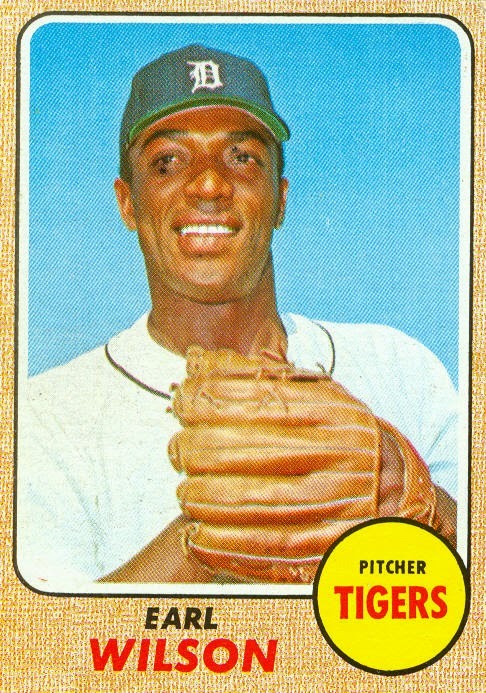 In 1959, Wilson became the first black pitcher to play for Boston. After a full season back in triple-A in 1961, Wilson made the Red Sox for good at the start of the 1962 season. 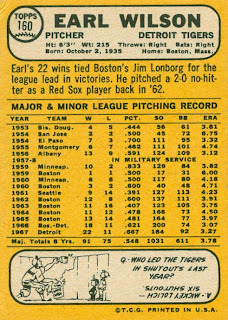 From '62 to '65, Earl averaged 12 wins a season, as he and Bill Monbouquette formed a 1-2 punch in the starting rotation. 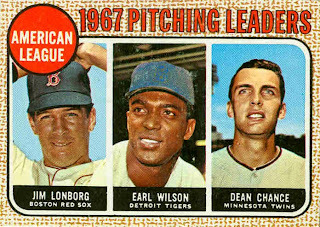 With the emergence of Jim Lonborg and others, both Wilson (age 30) and Monbouquette (29) were deemed past their prime, and were dealt to the Tigers in separate deals. Monbo was traded in December ’65 for a bag of beans, and Wilson, the following June for an aging Don Demeter. 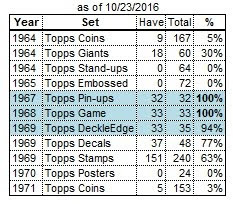 Wilson was 5-5 at the time of the trade, but went on a 13-6 tear with the Tigers, to finish up at 18-11, good for 3rd best in the AL. 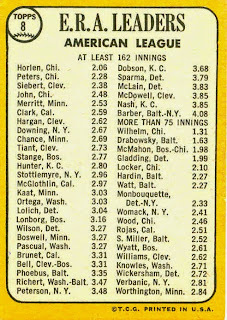 His 200 strikeouts was also 3rd best. In 1967 he won 22 games, tieing him with Lonborg for the most victories. The Red Sox lost the ’67 World Series by 1 game. If they had held onto Wilson, the Series outcome could have been different. 1970 was Wilson’s last season. With his record at 4-6, he was sold to the Padres in mid-July. After a lackluster 1-6 showing with San Diego, he was released in January 1971. Wilson died from a heart attack in April 2005, at age 70. Alvin McBean was born and raised in the US Virgin Islands. 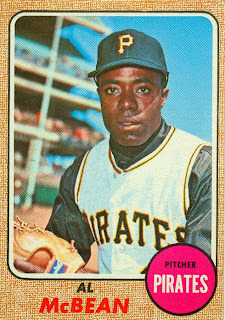 He was signed by the Pirates in 1958, and pitched in their farm system for 4 seasons (1958-61). He started out as a swingman, but by 1961 he was primarily a reliever. 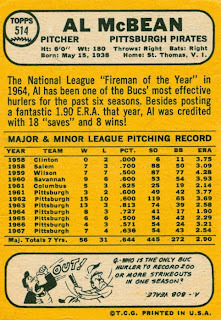 Al was summoned to the majors in early July, and made his first of 27 appearances for the Bucs on July 2nd. He pitched in relief except for 2 starts in mid-September. 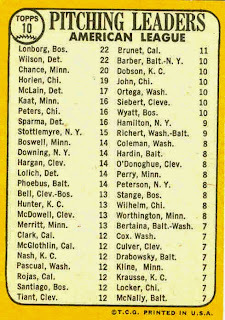 When I was "playing" with my baseball cards back in the day, I always figured McBean to be a 2nd-tier starter behind Bob Veale and Steve Blass, and that the bullpen was headed up by Elroy Face and Pete Mikkelsen. Tonight, I’m finding out that McBean was a key member of the Pirates bullpen from 1963-67, and that my pre-conceived notion of him really only matched his 1968 season. In 1962 McBean was plugged into the starting rotation, and compiled a 15-10 record in 33 games, as the #2 starter behind veteran Bob Friend. In 1963 he was back in the bullpen, and fashioned a 13-3 record along with 11 saves (2nd on the team behind veteran closer Elroy Face). 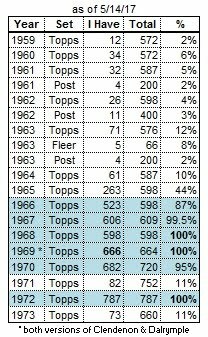 In ’64 and ’65, Al surpassed Face as the team’s save leader with 22 and 18 saves for those 2 seasons. He was also named Reliever of the Year by The Sporting News in 1964. After 2 more seasons in the bullpen (behind a rejuvenated Elroy Face), McBean was put back in the starting rotation in 1968. 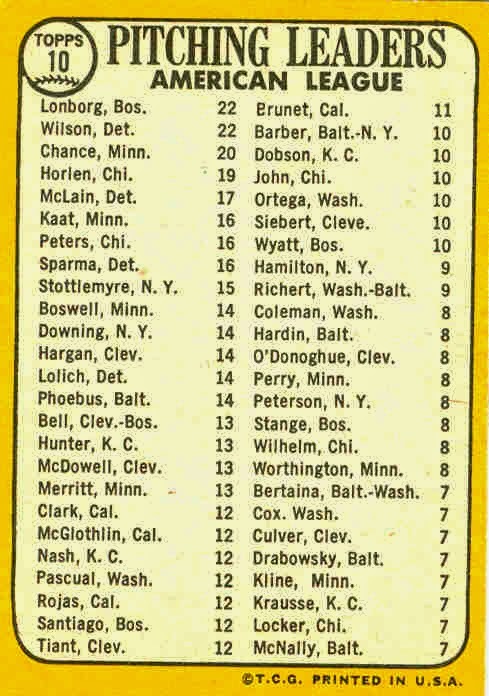 By now, Bob Friend and Vern Law were long gone, with Bob Veale running the show, and Steve Blass at #2. 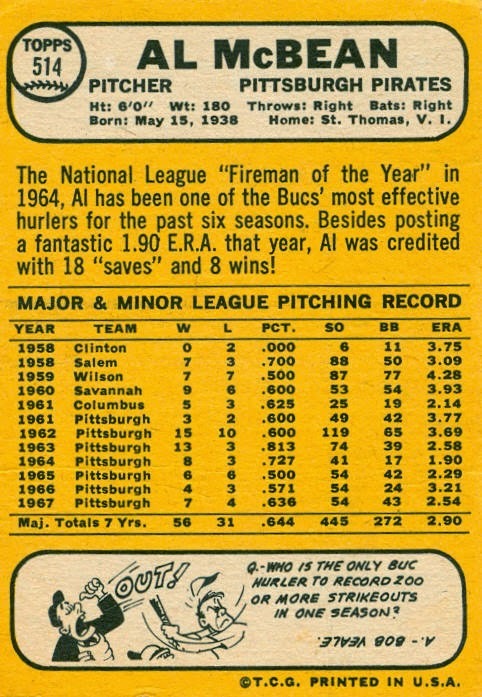 Al was the #3 starter in his final season with the Pirates, compiling a 9-12 record in 36 games (28 starts). After the season he was selected by the Padres in the expansion draft. After only 1 game with San Diego, McBean was traded to the Dodgers in mid-April for shortstop Tommy Dean. Al made 31 relief appearances for LA for the remainder of the 1969 season. Al began the 1970 season with the Dodgers, but after only 1 game he was released on April 24th. The Pirates re-signed him on the same day, but after pitching only 10 innings over 7 games (and sporting an ERA of 8.10), he was released on May 18th, ending his major-league career. I learned tonight that McBean spent the remainder of 1970, and 1971 pitching for the Phillies’ AAA team in Eugene, Oregon. 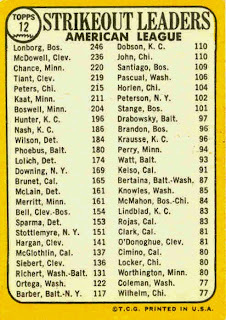 Here are the 1968 cards showing the previous season's American League pitching leaders in ERA, victories, and strikeouts. 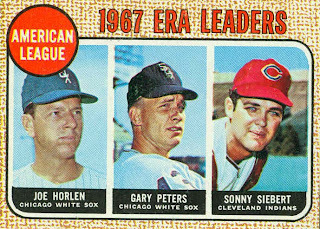 Like many of the mid-1960s' AL pitching leader cards, the Indians and White Sox are well represented. 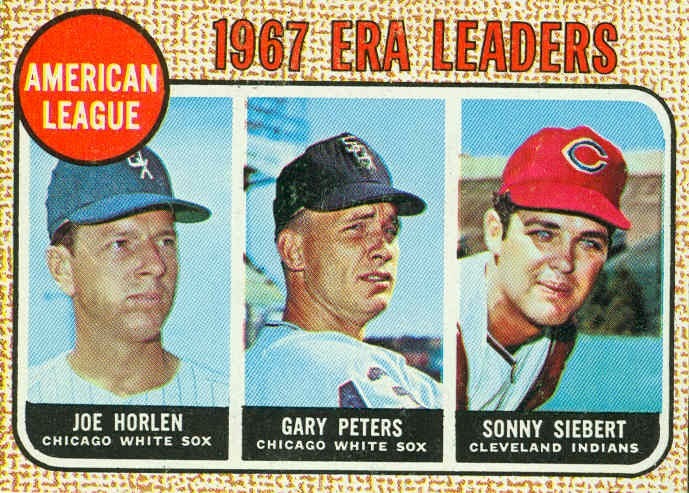 Joel Horlen and Gary Peters (both frequent guests on the AL ERA leaders cards) gave the Chisox a great 1-2 punch. 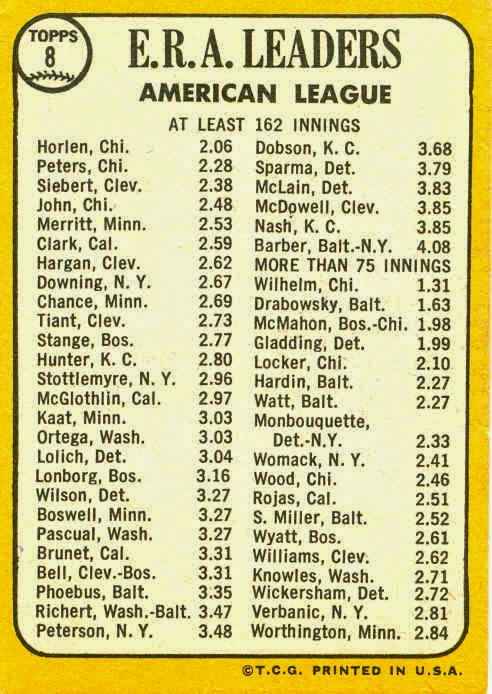 Their teammate Tommy John just missed being included on this card by a 0.10 margin! The Indians' Sonny Siebert rounds out the top three, which he also did two years earlier. The ERA leaders cards also include a "more than 75 innings" category (primarily for relievers). Leading that group was 44-year-old Hoyt Wilhelm, with a miniscule 1.31 ERA. 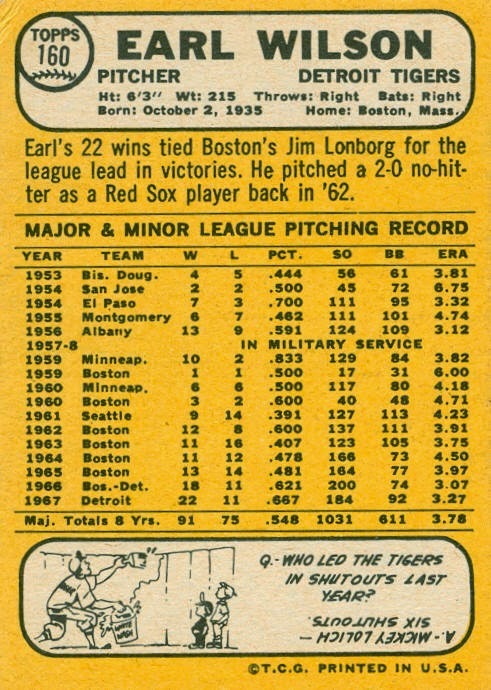 Having his career year in 1967, Jim Lonborg topped AL pitchers with 22 victories. Actually, Jim shared the lead with Tigers' pitcher (and former Red Sox teammate) Earl Wilson. 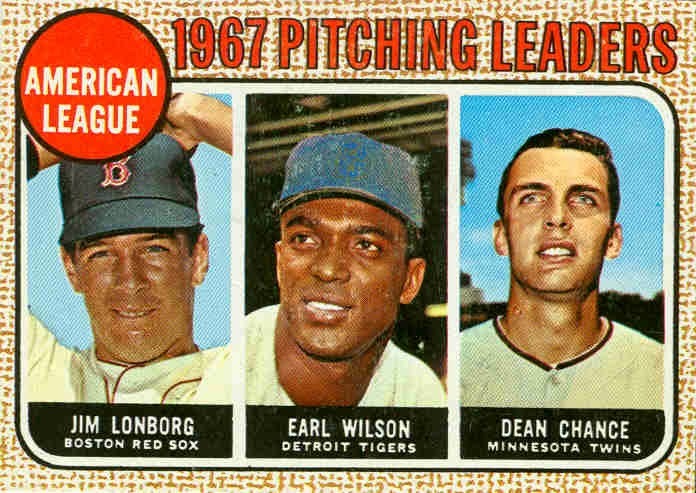 Wilson was traded to the Tigers during the 1966 season, and finished among the top 3 that season. It seems like if they had kept Wilson, he could have made the difference in the 1967 World Series, which Boston lost in 7 games. The only other 20-game winner in the AL in '67 was Dean Chance, in his first season with the Twins. 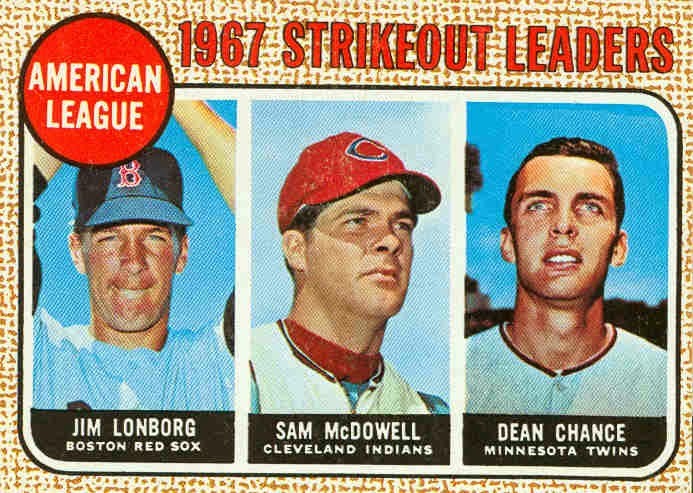 Here's Lonborg again, edging out Sam McDowell by only 10 strikeouts. 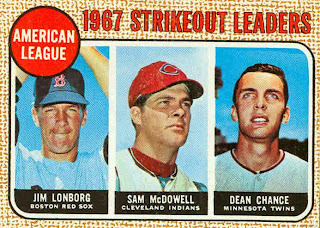 McDowell led the AL in strikeouts in '65, '66, '68, '69, and '70. Dean Chance finished 3rd here also, with Topps using the same photo as above. 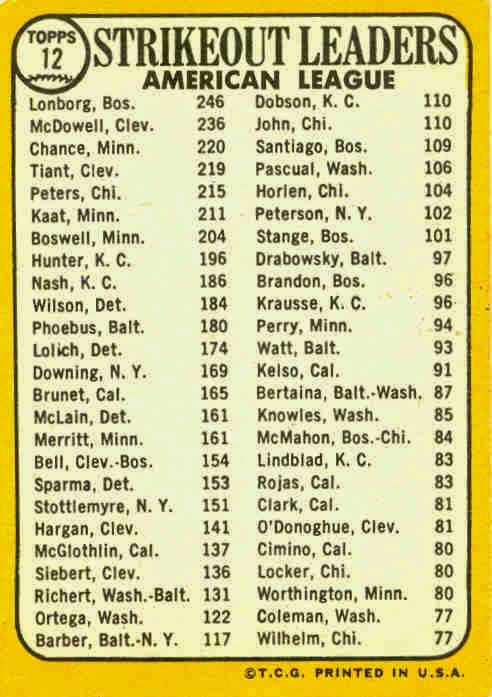 Rounding out the 200+ strikeout club were two more Twins, an Indian, and the White Sox' Peters. Click on the "league leaders" label below to see all the other cards for this year.